Today, we are featuring a parasite that lives on the ocean sunfish (Mola mola) which happens to be the heaviest known living bony fish in the world. One can say that it is a truth universally acknowledged (by myself at least) that any sufficiently large animal must be in want of some parasite, and the sunfish is no exception. Its massive body is a prized piece of real estate for a wide variety of parasitic organisms. Accacoelium contortum is the most commonly reported species of sunfish parasite, but even though they are numerous, not much is known about their biology. It is a digenean trematode - or parasitic fluke - and while most trematode flukes are parasites that live in the intestinal tract of their final host, A. contortum is a bit different. Occasionally you might find some of them in the gastrointestinal tract - which is where you'd expect to find most adult flukes - but more often found in the sunfish's mouth, gills, and pharynx (the part which roughly corresponds to back of the throat). Such a location is highly unusual for a trematode, it is akin to finding a seal living up a tree. Scientists in Spain examined the parasites of 106 sunfish which were caught as bycatch and found that almost half (47.2%) were infected with A. contortum. Most of the flukes were found on the gills, some in the back of the throat near the pharyngeal teeth (which are a set of teeth that ray-finned fishes have at the back of their throat) and only a few were in the stomach. They noticed that usually the gills on the fish's right side are more heavily infected - this asymmetrical distribution is similar to what has been observed for other parasites, where they tend to congregated towards one side of the host, though in this case it's not entirely clear why they do this. In addition to preferentially hanging out on one side of the host, they also tend to congregate in clusters comprised of dozens of individuals, with those in the pharynx forming larger groups than those on the gills. While A. contortum seems to do quite well in its rather unusual (for a trematode) habitat, the basic body plan for trematode is that of an internal parasite. So how does one modify a body plan for living inside the cosy confine of a host's body to a life clinging on to the more exposed parts of the host? Fortunately for A. contortum there are some functional overlaps between living in a fish's intestine versus living on its gills. While it lacks the hooks and sucker clamps of monogenean flatworms which are specialised for ectoparasitism, A. contortum has co-opted its large and muscular ventral sucker for hanging on to the sunfish's gills. 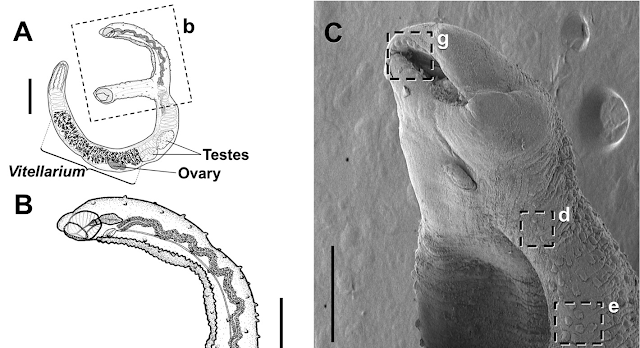 Other trematode species use their ventral sucker to attach to the intestinal wall. In A. contortum it also function as the main attachment organ, but on a different part of the host's body. Additionally, this fluke's hind body appears to be long and prehensile, which it might to able to use to grip like a chameleon's tail (to a limited degree). The parasite's attachment also cause the surrounding host tissue to grow around them. This is most likely part of the sunfish's immune response, sealing the parasites off from the rest of the body. But this might actually work to the parasite's advantage because now it sits in a cosy little flesh bag which is tightly secured to the host body. The scientists who conducted the study also noticed that A. contortum has a series of tiny bumps and protrusions around the front of its body. They suggested that the fluke might actually be secreting growth factors which encourage host tissue growth through those bumps. 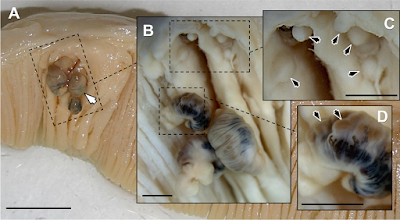 Other parasitic flukes have been known to secrete proteins which manipulate host tissue growth, so it is possible that A. contortum is also capable of doing so. This is also supported by the observation that those protrusions are not found on immature flukes or those that live in the digestive tract which is more sheltered than the sunfish's gills. The way that A. contortum apparently manipulates the sunfish's tissue is rather reminisce of how gall wasp induces their host plants to form a protective gall. While those galls protect their inhabitant against predators, in this case A. contortum, the flesh bag that it induces provide the parasite with a shelter on an otherwise exposed and turbulent location. Ahuir-Baraja, A. E., Padrós, F., Palacios-Abella, J. F., Raga, J. A., & Montero, F. E. (2015). 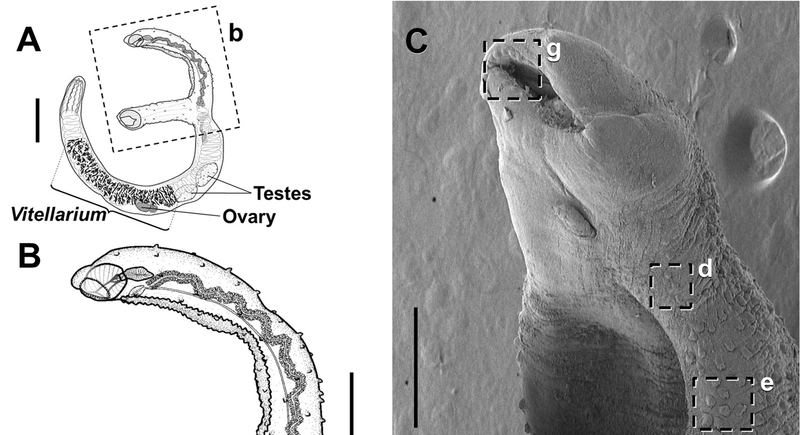 Accacoelium contortum (Trematoda: Accacoeliidae) a trematode living as a monogenean: morphological and pathological implications. Parasites & Vectors 8: 540. P.S. I recently wrote a post about prehistoric/fossil parasites (which you can read here). On a related note I also wrote an article for The Conversation which focuses specifically on the fossil evidence for (non-avian) dinosaur parasites - you can check it out here. Vampires have undergone a lot of image change over the centuries and they are a common part of many culture's mythology. But vampires are also a common part of nature. Blood sucking is a life style found in over 14000 known living species. Even those vampires themselves have blood suckers that feed on them. But living as a blood-sucker require special adaptations, and one particularly unlikely vampire is Colubraria (formerly known as Cumia) reticulata, the vampire snail. It is a marine snail that feed on fish blood and it belongs to a family of vampire snails called the Colubrariidae - at least six species are known to feed on blood and it is quite likely that it is a trait shared by the entire family. So just how does a snail feed on a comparatively agile animal like a fish? First of all, they feed at night when fish are asleep, a survival tactic shared by other blood-feeders like vampire bats. They also have modified mouthpart can can slice flesh like a tiny scalpel, which is mounted at the end of a long proboscis that can stretch to three times its body length. This enables it to bypass even a parrotfish's mucus sleeping bag which normally protects it against other nocturnal blood-suckers. But those behavioural and anatomical adaptations are just the start, most of the tools C. reticulata brings to this blood feast exist on a molecular level. The vampire snail is able to secrete a range of specialised proteins, most of which have multiple effects on the host and overlap in their functions. First of all when the snail is about to cut into the fish's flesh, it spits out an anaesthetic similar to compounds secreted by other blood suckers like mosquitoes, to numb the area of incision. Once C. reticulata gets access under the fish's skin, other types of compounds come into play. A major problem for any would-be vampire is the natural tendency for blood to clot. Imagine drinking a smoothie and suddenly it turns into a big block of solid curd. So during feeding, C. reticulata secretes a chemical cocktail that disrupts the process of blood clotting and wound healing. Furthermore, the anti-coagulant action needs to be active until the blood is fully digested, so the snail also have secondary glands in its oesophagus that secrete other types of proteins to keep the blood liquefied as it sits in the snail's gut. In addition to anti-coagulants, C. reticulata also spits out vasopressive compounds that increases the fish's blood pressure. This is very important to the vampire snail's feeding style because its long proboscis is actually not very muscular - so it is not that good at sucking blood. Instead, the snail injects compounds that increase the fish's blood pressure so that it will actually be pumping blood into the snail's gut. When scientists looked into the vampire snail's molecular arsenal in more details, they found that many of the proteins secrete by the vampire snail can be considered as pretty standard fare for a vampire and are similar to those found in terrestrial blood-feeders like ticks and mosquitoes. 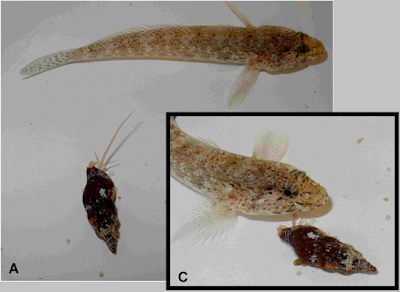 However, C. reticulata also has a few tricks up its shell which are unique compared with other vampires, in particular the complex of protein which it secretes to temporarily suppress the fish's coagulation and healing mechanism. This is actually quite a feat because comparing with other vertebrate animals, fish are very good at repairing vascular injuries, especially in delicate blood-rich organs like the gills which are exposed to the external environment. Another substance unique to the vampire snail is turritoxin - which is also produced by the coneshell. At this point, scientists are unsure how vampire snail (or the cone shell) uses turritoxin in their hunting behaviour, though it is possible they release it as a way of lulling the fish into a compliant state. Scientists have observed that fish which are approached by the coneshell enters a kind of "hypnotic" state before they get stung with the coneshell's highly lethal neurotoxin. Perhaps the vampire snail also release turritoxin to coax its victim into a deeper state of sleep. By investigating the molecular arsenal of the vampire snail, scientists can gain insight into how the vampire snail evolved to be a blood-feeder. In addition, some of compounds secreted by C. reticulata can finely manipulate the physiology of their host, and examining them in detail may lead to the development of compounds with useful medical and pharmaceutical applications. Modica, M. V., Lombardo, F., Franchini, P., & Oliverio, M. (2015). The venomous cocktail of the vampire snail Colubraria reticulata (Mollusca, Gastropoda). BMC Genomics,16: 441.